Wine and Dine, Here We Come! 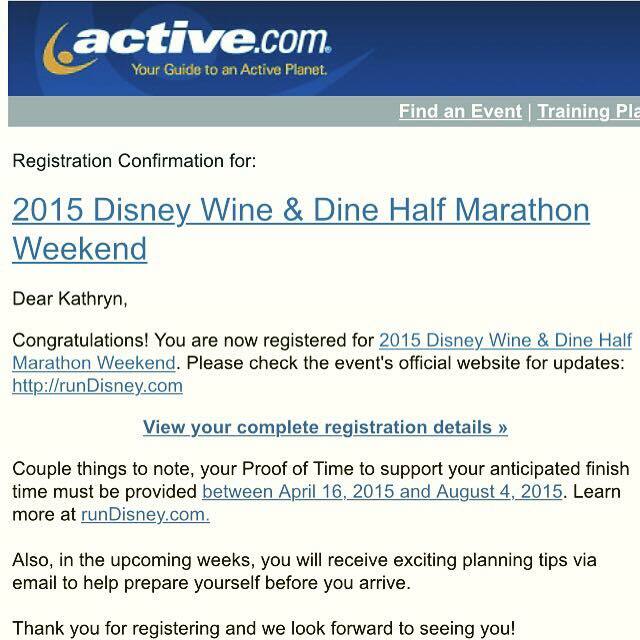 That’s right, Preston and I will be running the Wine and Dine Half Marathon at Disney World on November 7th. When we returned home last January from Marathon Weekend we agreed that Wine and Dine would be our next runDisney race. Logistically it didn’t work out for us to run the race this past November, so we’ve had our sights set on running it this year. One of the reasons why we became Annual Passholders before our trip to Disney this past December was in anticipation of registering for this race. And despite how quickly the early registration slots sold out yesterday, we were both able to successfully register! There are many reasons why we’re looking forward to this race. 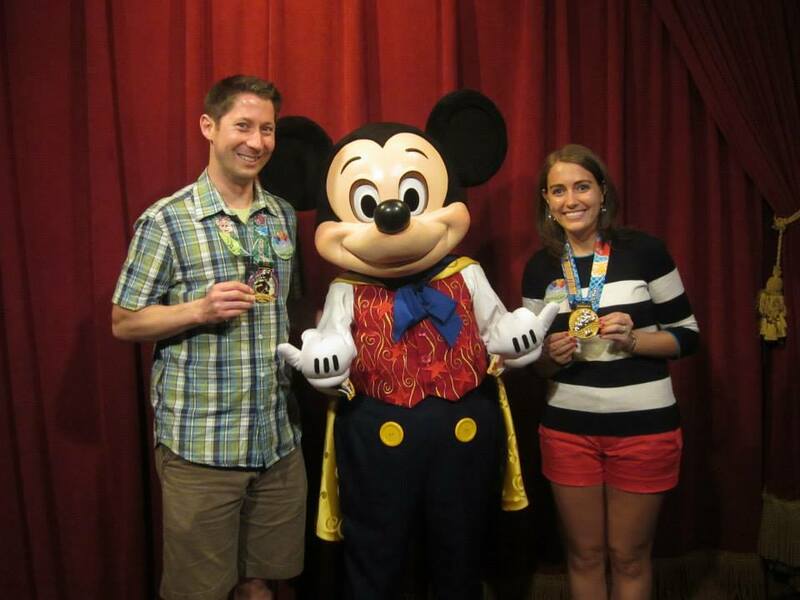 We’ve both been interested in visiting Disney World during the annual Food and Wine Festival held at Epcot every fall, and the half marathon is one of the highlights of the festival. With Preston having run both of his marathons at Disney, and I having run my first half marathon at Disney, we’ve both been looking forward to returning for another race weekend. We’re excited to experience a race weekend other than Marathon Weekend, and this race will be unique as its a night race starting at 10:00 p.m.
We can’t wait to celebrate another runDisney race weekend with Mickey! This week I’ve registered for three half marathons. On Monday I registered for two of the races that I’ll be running as a Rock ‘n’ Blogger – Rock ‘n’ Roll Virginia Beach on September 6th and Rock ‘n’ Roll Philadelphia on October 31st. Yes, that means that I’ll be running two half marathons on back to back weekends. It’ll be a challenge, but I’m definitely up for seeing what I’m capable of! 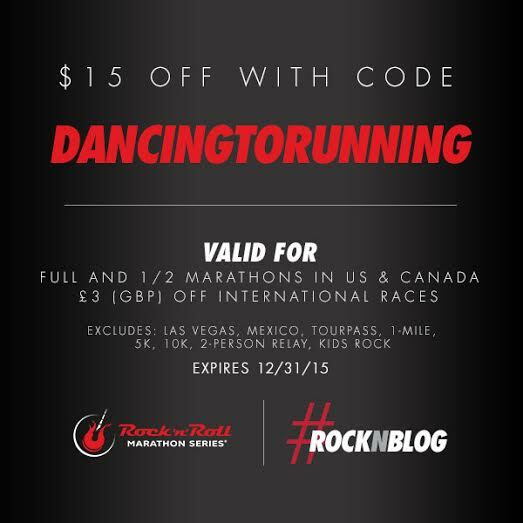 And don’t forget that if you’re interested in running any of the Rock ‘n’ Roll half or full marathons in the U.S. or Canada in 2015 that you can save $15 off of registration by using code DANCINGTORUNNING (excludes Las Vegas). That brings this year’s half marathon total currently to four, one more than I ran last year. I still need to choose one more Rock ‘n’ Roll race to run this year, and then I’ll likely be done registering for this year’s half marathons. QOTD: What race(s) are you looking forward to running this year? This entry was posted in Races and tagged Rock 'n' Blog, Rock 'n' Roll Philadelphia, Rock 'n' Roll Virginia Beach, runDisney, Wine and Dine Half Marathon. Bookmark the permalink. 75 Responses to Wine and Dine, Here We Come! Thanks Krystal! Definitely looking forward to all of my races! I hope you have fun! I did the 5k as my first Disney race in 2010 and it was such a fun atmosphere the whole weekend. Yeah for Disney races! I have always wanted to do one! Congrats! Can’t wait to see pictures! Congrats! That should be so much fun. I am still having trouble with my foot but have a Ragnar coming up in 8 weeks that I haven’t started training for yet-yikes! Hopefully your foot heals soon! You will love the Wine and Dine race weekend. Are you planning to sing up for the Jingle Jungle 5k too? That is a really fun race through Animal Kingdom! While it was tempting to register for both races, we’ve decided to not do the 5k. I will look forward to hearing all about this race as I plan on hopefully running it someday! I can wait to share my experience with everybody! So excited for you for all these races!!! You’re going to have a blast!!! That’s awesome that you got in yesterday 🙂 I’m taking my chances with general registration for this one when it opens up in a couple weeks. Fingers crossed! I’ll be thinking good thoughts that you’re able to register! ack i really hope 2016 is the year for wine and dine for me because i really want to run that one! excited for you!! i’m now looking forward to the mcm lottery which is next week. and then in june, i have the lottery for the 2016 big sur marathon. sincerely hoping i’m successful! I hope you get into both MCM and Big Sur! I’ve always wanted to do that race, congrats! I’m looking forward to the Pittsburgh Marathon because it [hopefully] means I get to go home for a week. No summer/fall races planned yet but I’d love to do a really pretty one with my boyfriend, maybe down in Big Sur or further south along the coast. I’ve heard nothing but great things about Big Sur. Wahoo! I know you are going to have a fabulous time. I love everything Disney. We got married at Disneyworld! Running Wine n Dine is one of my goals as well. This yr we may be doing Savannah that wkend. I have always wanted to visit Disney during that time. It was tough to choose between Wine and Dine and Savannah. Hopefully we’ll be able to run Savannah one day! Yay! I also got in yesterday for the 5k and half for wine and dine. Yall are going to love it: it’s my favorite half marathon period (and I ran it last year in the rain and was injured and I was still obsessed!). And you can totally run back to back races; just train for it and use wine and dine as a fun run with lots of pictures! That’s my plan: I’m doing NYC Marathon and then the 5k and half and then flying back to LA for Avengers! Oh we definitely plan to have lots of fun at Wine and Dine. I can’t wait to take lots of pictures during the race! I hope you and Todd are able to register for Wine and Dine! How exciting! I would love to do this race. I mean who wouldn’t want to? It has the word “wine” in it? How exciting! I really want to do the wine and dine, hopefully next year it will be on my schedule. I have run the VA Beach 1/2 for the past three years , it is a great race, unfortunately I will not make it this year! That’s exciting about Wine & Dine! I really want to do that someday. I can’t do a Disney race this year after last year’s Glass Slipper Challenge – I’ll try for something in 2016. Can’t wait to hear about W&D! I’m still debating the other 2 RnR races after DC – I might see you at one of the ones you picked! Hopefully I’ll see you at one of them! yay! I have a 5k in August and possibly a half in November. I am super excited about the KY Derby Half in April. I can’t wait to run through Churchill Downs! That is going to be such a fun race! How fun! Everyone I know who’s done that one loved it. I’m pumped for lots of RnR races this year (Vegas, Savannah, Vancouver??) then Twin Cities Marathon. Sounds like a great lineup of races! So jealous!! You are going to have a blast! Disney races are a great way to get into running and racing. Disney World Half was my first half marathon. This sounds like alot of fun . I do not race to be racing. I typically sign up last minute so I have nothing planned. LOL I know pretty bad but I would probably do no more than a 10K. This is such an awesome race you will have a blast! I did it in 2013 in a German Beer Girl costume and then hung out at Germany for the after party! I loved Wine and Dine much more than the marathon weekend races. I’d like to get down at some point for Tower of Terror – sounds like they have the after-party element as well. German Beer Girl costume…what a great idea! FYI – Tower of Terror is currently suspended. No word yet on when runDisney will bring it back. You’ve had a busy week entering races:) That is awesome though! Congrats on getting into the Disney race! So many awesome ones to look forward too this fall! Ahhh! I’m so excited for you!!!!!!! This sounds like so much fun! The latest I’ve ever raced was probably 8 or 9pm. I don’t know if I’d have the energy to start a race at 10pm lol! We’re definitely going to have to sleep in and then pace ourselves during the day before the race starts. So fun!! I wanted to run Philly but I’m not sure I can handle doing a half the week after Marine Corp!! I’m still undecided on my third, but my guess is it will be either VA Beach or Brooklyn, depending on the date! I don’t blame you about not wanting to run Philly only a week after MCM. Whooo hooo!!!! See you guys there because this Black Dog is IN!!!!! Yay! We’ll have to meet up while we’re there! Awesome! I ran W&D in 2011, it was truly a one of a kind experience! Definitely looking forward to not having to wake up at 3am for this Disney race.